Quarry the granite rock with razors, or moor the vessel with a thread of silk; then may you hope with such keen and delicate instruments as human knowledge and human reason to contend against those giants, the passion and the pride of man. I was not a Catholic or any sort of Christian then, but I thought that was not only a very fine bit of prose but also real wisdom. In one sentence it exhibits what I later came to see as the persistent shrewdness and balance of the Catholic mind, which does not disparage or dismiss human capacities such as reason, but yet never forgets that they are not sufficient to keep us on the right path. I imagine most people reading this have at least heard of Newman and have some idea of his significance for the Church; this is surely true for anyone who’s ever been involved or interested in the Anglican tradition. Many of the saints in this series have been ones of whom little is known. Newman is the opposite: not only did he live in the modern era, but he was very well-known and influential in his own time, and continues to be so. So his life is known and studied in great detail. I’m going to give you the briefest biographical summary. A moment on the Internet will turn up a great deal of information; for starters, here is his Wikipedia article. Newman’s life shows a pattern which has become somewhat familiar since his time: early embrace of evangelicalism, movement into high-church Anglicanism; awareness of the difficulty of reconciling Protestantism with the historic Christian faith; conversion to Rome. He was an intellectual and scholar by nature, and a celibate by choice, and the drama of his life takes place in the world of ideas. Externally there is nothing very exciting to note. He was associated with Oxford University from his late adolescence until 1843, when, recognizing that he could no longer in good conscience remain an Anglican, he went into a sort of limbo that lasted until 1845, when he was formally received into the Catholic Church. He was one of the central figures in the Oxford Movement, which attempted to bring Anglicanism into greater harmony with the Catholic tradition, and in the associated Tractarian Movement, which issued a number of tracts, many written by Newman, making the Catholic case for Anglicanism. In the end many of the people associated with and influenced by the Oxford Movement did convert. In 1864 the very anti-Catholic Anglican clergyman Charles Kingsley wrote something about Newman which provoked one of Newman’s most well-known works, the Apologia Pro Vita Sua (Defense Of His Life). It is not an autobiography, not even a spiritual autobiography, in any usual sense. Newman introduces it as a “History of my Religious Opinions,” and that’s exactly what it is. We learn about those in great detail, but most of what can be learned about the man himself and his life can only be inferred. These were fighting words, and a fight was what Kingsley got, and got the worst of. Newman objected, and Kingsley responded smoothly that he must have misunderstood Newman’s words, and was glad to be reassured that Newman had not meant what Kingsley thought he meant. This sly tactic did not work. “Never meant it? I maintain that I never said it,” responded Newman. A lengthy and complex war of words ensued in which Kingsley only dug his hole deeper. In the end Newman’s reputation was enhanced, and Kingsley’s diminished, because it was clear to any fair-minded observer, whatever his view of the Catholic Church, that Kingsley was in the wrong. The Apologia followed from this controversy, because Newman believed that at the root of Kingsley’s accusation, and his confidence in making it, was a widespread and largely whispered suspicion that Newman had for many years been secretly Catholic, remaining formally Anglican and operating as a subversive within the Church of England. 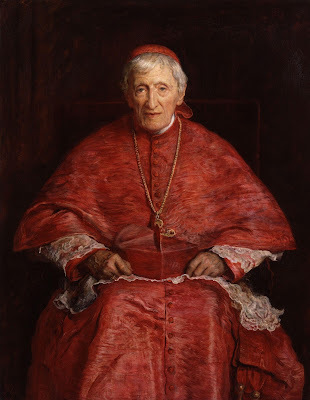 The idea of sneaky malicious Catholics plotting in dark places against everything decent had a powerful hold on the English (and American) Protestant mind in the 19th century, and this gave Newman the chance to bring it into the light and combat it. In the Apologia he described in detail every turn of his thinking, and the action resulting from it, with the aim of showing that he had never done other than act openly in accordance with his evolving convictions. ...now here, in the middle of the fifth century, I found, as it seemed to me, Christendom of the sixteenth and the nineteenth centuries reflected. I saw my face in that mirror, and I was a Monophysite. His sermons collected in a huge volume as Parochial and Plain Sermons are full of insight and wisdom. The hymn “Lead, Kindly Light” is a setting of one of his poems. His long poem, “The Dream of Gerontius,” about death and judgment, was set to music by Edward Elgar; if you are a classical music lover and don’t know it, you should seek it out, as it is one of Elgar’s best works. And Newman himself was an amateur musician who played violin and viola. Away with you, Mr. Kingsley, and fly into space! Your name shall occur again as little as I can help, in the course of these pages. While it is John Henry Newman’s intellectual legacy that has understandably received most attention in the vast literature devoted to his life and work, I prefer on this occasion to conclude with a brief reflection on his life as a priest, a pastor of souls. The warmth and humanity underlying his appreciation of the pastoral ministry is beautifully expressed in another of his famous sermons: “Had Angels been your priests, my brethren, they could not have condoled with you, sympathized with you, have had compassion on you, felt tenderly for you, and made allowances for you, as we can; they could not have been your patterns and guides, and have led you on from your old selves into a new life, as they can who come from the midst of you” (“Men, not Angels: the Priests of the Gospel”, Discourses to Mixed Congregations, 3). If you read the Apologia or any summary of Newman’s life (I can’t speak to the full-length biographies such as Ian Ker’s), you know that as an Anglican he was the vicar of St. Mary the Virgin parish, a University parish which I take to have been (and probably still be) fairly posh. But this position included responsibility for a place called Littlemore, which to me and probably most people is just a name. But it was a poor neighborhood, a sort of suburb of Oxford, and Newman seems to have devoted more time as a pastor to it than to St. Mary proper. You can read a good deal about that in this paper (link is to a PDF file). It belies the image one is apt to have of Newman as an aloof and insulated don. Will Newman eventually be declared a saint? I have no idea, but if he is there will be a lot of rejoicing. Maclin Horton is the proprietor of his own blog Light on Dark Water from which sprang this series. You might want to check out the current series there, 52 Movies or last year's 52 Authors. In this series he has written about St Henrik, St. John Fisher, St Ansgar, St. Mary of Egypt, and St. John Kemble. Yes, thanks for this. 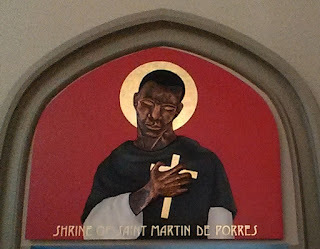 I like very much learning about his "personal virtue" and his time as a vicar in that poor neighborhood; going to download and read that linked paper about it.